The perfect quote to add an extra special touch to a plain space, create instant decor with PS I Love You with Heart Quote Wall Decals. Three wall decals assemble in seconds on any smooth, flat surface. Peel & stick additional two heart stickers to finish the look. 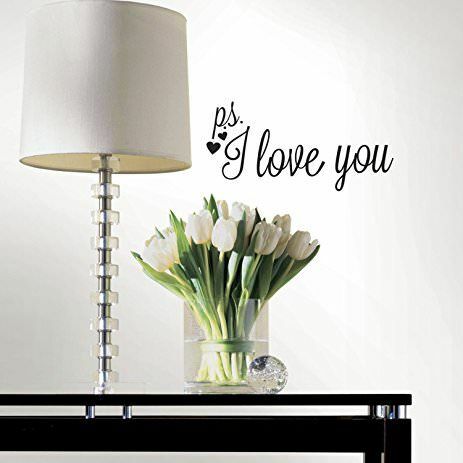 Designed with soft, black text and printed on a clear, high quality vinyl, PS I Love You with Heart Quote Wall Decals pair perfectly on any wall color. Even more reasons to fall in love, RoomMates Quote Wall Decals are removable, repositionable and reusable. Peel them, stick them and use them again and again. Our Wall Quotes are truly affordable wall decor that’s meant to last.